BOC needed to develop a major new garment handling, storage and distribution facility within their existing building at Swindon to service a large supply chain contract for Marks & Spencer. We designed a 10,000 square metre, three mezzanine floor to support a garment storage facility, with the ground floor dedicated to the movement, marshalling, receipt and despatch of garments via overhead conveyors. The structure is partially rack-supported to over 11 metres. 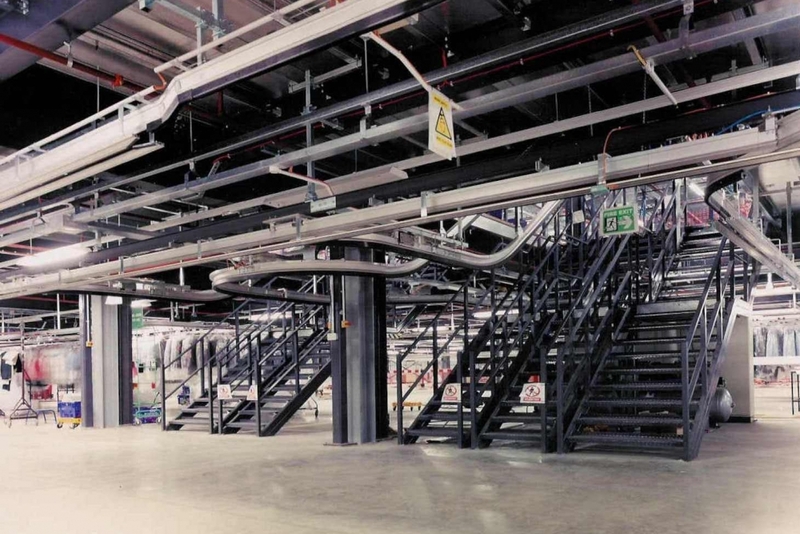 Elsewhere it is partially free-standing mezzanine floor to provide additional marshalling areas, equipment and staff access, materials handling installations and amenities. The rack-supported decking is pressed steel plank, while the surrounding mezzanine areas are high density particle board. We used open steel decking as part of the fire engineered solution to enable sprinklers to operate throughout all levels when necessary. As always, operator safety is a key consideration and, due to the considerable height of the structure, perimeters were protected with 2000 mm high mesh panels. Special safety trays were also suspended between garments racks and access walkways as an added safeguard in case a product ever became dislodged from the racks or overhead conveyors. The mezzanine project was delivered safely, on time and within budget enabling BOC to fulfil their supply chain contract for Marks & Spencer.